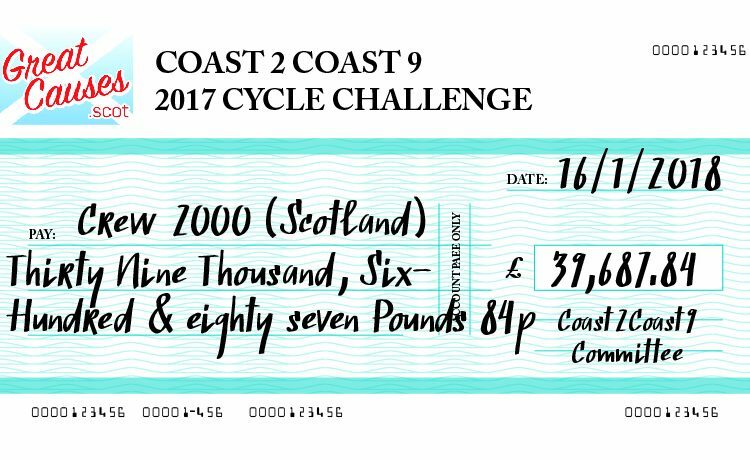 The sum raised was staggering, the difference it will make is immense and it wasn’t just about a cycle! The work that was done by the good people of BP North Sea will never be forgotten by Crew. I’m preparing for the Crew AGM and this cheque is one I can’t wait see handed over. While the collective effort can’t be overlooked, and certainly every one I spoke with at before and during the Coast 2 Coast event showed incredible interest in Crew and a passion for fundraising for all the organisations involved, this number would have been a lot smaller without the the genius fundraising activities created and implemented by just a very few on the C2C committee. You see the cycle was partnered with raffles and a ceilidh with it’s own fundraising games: all adding value and building team ethos and excitement and ultimately being inclusive of a much wider audience. If you are building a fundraising event, this is really worth considering, even on a small scale. Any event can be inclusive of its own awareness raising raffle where businesses for example, who may not be able to spare cash for sponsorship or workers to engage, may still be interested in being involved by donating a prize.